The Bungalow is a cosy, tastefully renovated cottage in the lovely village of Portuairk, with beautiful views of the bay and the Western Isles. With the shoreline right on your doorstep spend your days relaxing on sandy beaches, exploring hidden coves, spotting sea eagles and dolphins in the bay, and rambling along miles of coastal trails. You couldn’t ask for a better position, right on the sea front with spectacular views from the lounge and main bedroom windows. Sheep on the beach, sheep in the garden, sheep in the road. Loved it! The kitchen was well stocked, the lounge comfortable, the main bedroom could do with a new mattress, the bathroom looked quite new. We had a problem with the flush on the toilet, we reported it and within minutes a man arrived to have a look. He couldn’t find a problem but it carried on being troublesome as soon as he left so we reported it again. The chap arrived quickly again but was unable to fix it, so we had to revert to throwing buckets of water down. The sky TV didn’t work. Internet came and went but you have to remember that you are in the middle of nowhere so to have anything at all is a bonus! Youngsters might think otherwise! I would definitely return to this place, the location is really superb. So much wildlife and lovely walks. There are hardly any local facilities but that made it all the more special. There was a store that seemed to stock most things. A fantastic cottage, very well equipped and with a wonderful view! We had a great stay at the bungalow, 3 adults and 2 kids (5 and 7). We loved the location and proximity to the beach. The kitchen is particularly well equipped, the beds comfortable and the location fantastic. Really good. We ordered a veg bag from Ardnamurchan community gardens and bought other high quality food from the local producers market in Kilchoan. Stayed at location several times but first time at the bungalow. 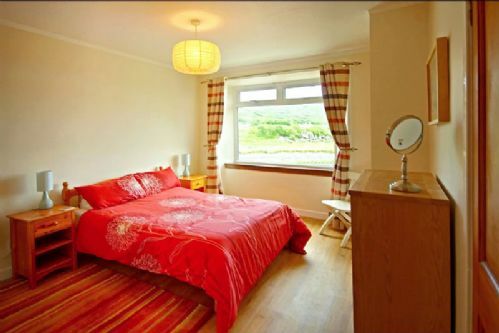 It is clean, homely and well equipped, being placed in an idyllic location. Nearest large shop is the ferry ride from Kilchoan to the Co-Op at Tobermory. Steading Holidays are good booking agents . Our only gripe was the fact that the TV didn't work (no channels available) which would have been an option when we settled for the night. There was a phone number for the caretaker, but as we didn't get a phone signal until half way through the week, we didn't bother to contact him. I would hope to stay there again. The Bungalow is a great place to say- what a location! Slightly frustrating that such a vital amenity as the fridge was not in good order. The fault had been previously reported and needed more urgent attention. Very comfortable house in an extraordinarily beautiful and peaceful cove , with wonderful sunsets. This is a note to upfront reviews. It is rather too demanding to require a review of 100 plus words in order to submit a response. I am very happy to give feedback but it's not appropriate to expect an essay . We were very happy with the house, loved the situation and there were no difficulties. Have already mentioned to friends. Limited shopping. Community garden vegetables very welcome. We had a great 9 night stay in November to unplug and unwind. The location was great as it's at the end of the (single track) road and there's nothing else there. The cottage was well equipped with a great fireplace and decent WiFi, though we couldn't get Sky to work. It is right on the water's edge so we spent hours just watching the tide come in and go out. We saw plenty of seals and local sheep roaming the hamlet of Portuairk. There was some mold on the walls we arrived to, but we don't know how long it was closed up before we arrived. All in all a great and very remote spot, and we'd love to come back. We were lucky with the weather and enjoyed exploring the surrounding beaches. Had campfire on beach and watched the sun go down so very peaceful could stay here forever ,we all fell in love with Portuairk,and intend coming back next year . Have already given your address to a few friends. Good enjoyed coffee at lighthouse. Shame Sonachan closed . sea, rocks, mountains, peace - what more could you want? Beautiful location, beautiful views, very good cottage with every facility you could need. The best view from the dining room window anyone could ask for. Very good, all helpful and friendly. The house was fab - in most ways but really not clean! It was a fab place to be and a really great house - just such a shame re the cleanliness! The dishwasher was not clean, the floors swept but only really in the main areas (pretty grim around the edges and under sofas etc). Expected it not to be a shiny house but it was a bit of a shame...! As expected - not many! Perfect! The community centre and the play ground was good, shop exactly what was needed. Brilliant holiday! The Bungalow has a stunning setting with magnificent views out to Skye and the Hebrides. Lovely comfortable cottage with a wood burner which really gives that warm glow. Bedroom fittings are good quality and slept like one of the wood burners logs! We never realised that almost everything is closed around the peninsula after October which can limit what you do, but lots of lovely walks. The TV being broken was the one major fault, and it seemed to be the Sky connection. This was most noticeable from the Saturday afternoon right through to Monday morning, as the rain never stopped and everywhere was closed. Locals are friendly especially the huge dog next door which decided to go a walk with us! Hope to make a return visit for longer and ' in season'. Recommend it, but get that TV fixed! We were unable to complete the full extent of the holiday to me suffering a heart attack (still an in-patient awaiting bypass surgery) on the 3rd day so it is difficult raising a review. Hoewever what we did see and experience in that short time was an indication of what could have been an absolutely wonderful holiday. With its remoteness you take it for what it is - however The Ferry Stores in Kilchoan more than meets most needs. The bungalow is a very comfortable and well equiped cottage in the small settlement of Portuairk right next to the shore line. We spent many hours watching the changing tides and wildlife through the sitting room window. The cottage has wifi, an unexpected bonus and TV (although Sky signal a bit temprimental at times). There was plenty of room and the kitchen was well equiped. There are lots of great walks from the cottage, to the wonderful sandy beachs of Sanna bay, Ardnamurchann lighthouse and Achnaha in the ancient volcano. The nearest shop is four miles away in Kilchoan along a single track road. Also at the village is the Kilchoan Hotel that serves good food and on Friday nights does fish and chips to take out. Sanna bay by road is 18 miles ( walking about a mile) and the light house is about 3 miles away by road where you can enjoy fab views across to Mull and other hebridean islands. From Kilchoan we took the ferry to Tobermory and had a great lunch at Cafe Fish on the harbour front as well as sampling some whisky at the distillery. There are great opportunities to see wildlife. Out of the cottage window our regular visitors were grey herons, pied wagtails, cormorants and gulls. The sheep also kept us entertained. Also during our visit we saw dophins, skuas and deer. We went in September and the hills were coverd in heather. We visited Ardanmurchan in 2009 on the way from sky to mull and picked up a steadings brochure. Also looked on website. The bungalow was everything we could want. It had great views and was right on the beach. The accommodation had a well equipped kitchen and plenty of seating space. The staff at Steading Holidays were very helpful and managed to help us out with what we had forgotten to take with us. Would also recommend a boat trip with Staffa tours and visit the puffins if there at the right time of year. The nearest village (Kilchoan) is small but the village shop was well stocked and the staff helpful. Beautiful setting right on the foreshore with views over to Rum & Eigg. Reliable central heating and hot water. Adequate bathroom and kitchen. Would have preferred a king size double bed. Lounge layout is not great - a bit awkward and small; sofas a bit narrow - important details in times of in bad weather! Wood stove not coping with strong winds. Overall just OK, doubt that we would rebook this. Pretty basic. The community centre is uninspiring. We've just had a wonderful week staying in the Bungalow in Portuairk, not far from Ardnamurchan Point. The views from the cottage are as stunning as ever - this is our 2nd visit and hopefully not our last. The cottage is warm and cosy and a perfect location for exploring Ardnamurchan. Beautiful setting and the view fantastic. Walking in the area a delight as you rarely see anyone else. Saw dolphins an otter and a seal from the rocks outside the house. The house has everything you need for a week. Improvement would be better quality mattresses, and sofas that were more comfortable. This is a well appointed bungalow which is set in a fabulous location.Ideal for people who want to explore this beautiful area. It is not isolated but is certainly quiet and relaxing. Remote location amongst a hamlet, overlooking small tidal estuary facing due west. Fabulous sunsets and coastal walks from the door. Bungalow had everything we needed. Very comfortable. The Bungalow has every comfort and the most magnificent location and view. The fire is a particular asset when the weather is not so good! Great holiday. Been to the Bungalow about 5 times, as it is in such beautiful spot. Right by the sea, sheep coming to graze on salty grass. A great spot for a week away from it all. Very good. Community garden particularly fine. As we already live on the edge of very beautiful countryside in Yorkshire, it says something that we love coming here for the scenery! From the second that you step out of the door of the bungalow (and, in fact off the Coran Ferry) you're presented with stunning views. There are many walks of varying grades to suit everyone. My favourite times of the day are first thing, looking out the windows out to see towards the Small Isles, and at night where the clear skies and absence of light pollution give you superb view of the starry skies, with shooting stars thrown in. The Bungalow is very comfortable and has everything that you need for a really enjoyable week. The wifi, very important for anyone with children, is reliable and gives decent speeds. The kitchen is well-equiped and there is freeview via the Sky box. We had a really enjoyable holiday and the long drive is definitely worth it. The shop has a good selection of goods, but it would be worth bringing what you can with you when you travel to Sky. There's also a Coop on Mull if you want to get a few things when you get the ferry from Kilchoan. We spent a lovely, sunny week at the Bungalow. The location is stunning and the cottage itself very well equipped and comfortable. A truly special place. The location is excellent! A wonderful house and views that can't be beaten. Great walking and seeing seals bobbing away was an added treat. Great place to get into the water and swim. The walks to Sanna and to Bay McNeill are lovely and easy to do in a couple of hours or more if you want to go further. Will definitely be back once again to Portuairk - the best place to stay on the peninsula! The Bungalow had everything you needed & was very comfortable and cosy. Just sit outside as the sun goes down and the tide comes in or out, and what more could you want from a place! The community garden open shed to buy fresh veg is lovely and well stocked. Kilchoan shop has a good range of things. Fish & chips from the Kilchoan Hotel were delicious. Sonachan Hotel unfortunately wasn't open to non-residents even though the website & signs in Kilchoan said they were - had had a lovely meal there on our last stay in 2013. This was our first stay at The Bungalow, and we found it to be a lovely place to stay and a great location for exploring the area. The Bungalow was very clean and tidy. It had obviously been upgraded recently. The kitchen was supplied with everything we could have wanted. The entrance porch was large and great for hanging walking clothes and boots. the shower room was very new and practical. the beds that we used were comfortable. The only slight niggle was the layout in the lounge. The position of the two settees and chair made it difficult to sit and watch the TV, plus we did not find the settees particularly comfortable. But as we were there in the middle of June and out most of the time this did not really matter to us. The view from the windows is lovely and at high tide the sea came up to the other side of the road. There is a great walk from the cottage round to Sanna Bay, but this is a bit difficult in places so not suitable for everyone. The free wi-fi that is installed was a really good feature but beware that there is no mobile phone signal in the area. The phone in The Bungalow receives incoming calls but does not allow outgoing. Not sure if emergency 999 calls can be made. They probably can, but its worth checking with the agents. All in all if you want to stay at this end of the Ardnamurchan peninsular you won't go far wrong here. Lighthouse with cafe was excellent. Shop was adequate. Local hotels were good for meals. A fantastic location and the perfect position to see the most glorious sunsets. A fantastic holiday cottage ,warm and welcoming,excellently equipped and very comfortable. The situation could not be better ,placed right at the waters edge,beuatiful views all day long. Easy to see why it is already booked up for next summer. One of the best from Steadings that we have been in. Love the new bathroom. New sofa's not as comfy as previous one (too short seat depth and back height). Great location and facilities. Very peaceful even during poor weather. After a long journey of driving on the single track roads, the view from the window of the Bungalow was perfect. The house was very clean and had every thing I could possibly need.